...otherwise known as "Shakespeare in the Rain"
I was really planning to go this "As You Like It", but it rained on the nights I was free. I had even made plans with friends to go on SUN 7/27, but it rained. A total of 3 shows were canceled and 2 were stopped mid-show this year (out of 15 shows). 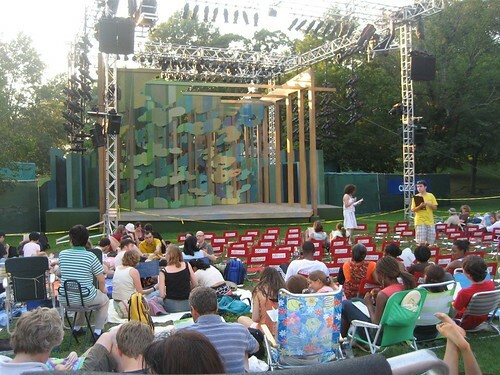 Why go to the annual Shakespeare on Boston Common? Because it's the works of the Great Bard for FREE! Thanks to the support of the arts, the citizenry should be thankful for the chance to experience quality theatre in open. Again these are professional actors with a passion for their vocation, but I wonder if some take this gig with the knowledge that they'll get a few nights off...? Hey, I had 10 out of 15 chances to see it. I'm not complaining -- just making my observation!